This is a guide on How to install latest VirtualBox, VirtualBox Guest Additions and Extension Pack on Arch Linux. Arch Linux is one of the most customizable, if not the best customizable Linux Distribution. 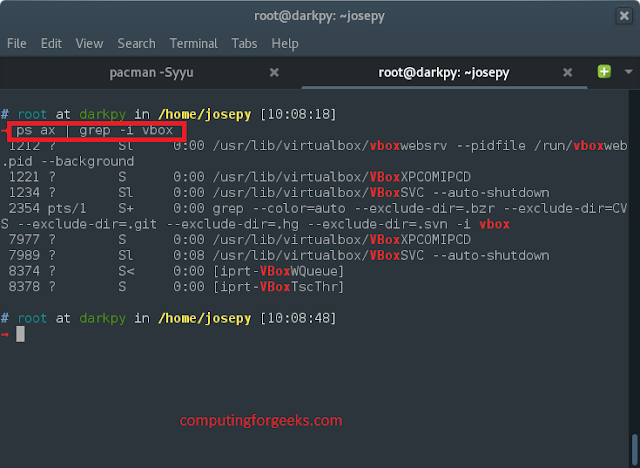 On Arch Linux, you can easily get latest VirtualBox from either Pacman mirrors or pull it directly from AUR. I started using Arch Linux 2015 and I have enjoyed the experience so far. It’s super fast, stable, easy to customize and many bells and whistles you can enjoy with this Linux distro. Without further ado, let’s get into the installation of VirtualBox on Arch Linux. As you all know, VirtualBox is a free, cross-platform consumer virtualization product. It’s one of most used Hypervisor for home/personal use. It allows you to run more than one operating system on top of existing Operating system.it’s free to use, Can run on Windows, Linux and Unix systems. One major advantage of VirtualBox over free Vmware Player is that vagrant tool for managing Virtual Machines is free for use with VirtualBox. But, with Vmware, you’ll have to use the paid version of Vagrant that integrate with Vmware. It’s easy to install VirtualBox on Arch Linux, just issue the following command on the terminal, and boom!, VirtualBox is installed. After installing, we’ll have to make the current system user a member of the vboxusers group. This will grant the user permissions to manage Virtual machines. Next step is to enable VirtualBox kernel modules to load automatically at boot time. Created symlink from /etc/systemd/system/multi-user.target.wants/vboxweb.service to /usr/lib/systemd/system/vboxweb.service. Make sure you’re running below command as a non-root user. Sorry for flagging out-of-date, pamac hadn't checked for updates and I missed the last updated time. It is now actually out-of-date, as the newly-packaged VirtualBox 5.0.10 complains about the 5.0.8 extension pack. Dependeny to 'fakeroot' is wether checked nor mentioned! @mabra: 'fakeroot' is a member of the package group 'base-devel', which is a prerequisite for building packages. Therefore it is not necessary to specify it as a build dependency. I am the current maintainer of virtualbox-bin in AUR. 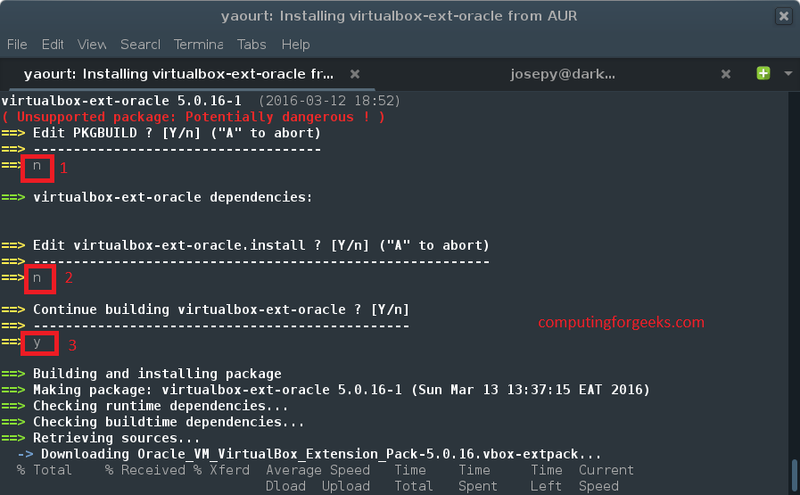 As virtualbox-bin and virtualbox-ext-oracle are related (a newer version of virtualbox-bin without an updated virtualbox-ext-oracle will not work), may I suggest making eachother co-maintainer? If you’ll be using vboxweb, you can enable it to start on boot up. Hope this article helped someone. You can drop a comment in the comments section if you encounter any problem.